To stroll around a traditional Russian mansion, you don't need to travel outside of Moscow or get squeezed in by hordes of tourists. In central Moscow, you’ll find 18th-19th century mansions that once belonged to aristocrats and merchants but now welcome visitors. Popular recreation areas like Tsaritsyno or Ostankino were once suburban royal residences with vast grounds. Today it takes at least half a day to examine their halls, pavilions, colonnades and grottoes. If your sightseeing time is limited, RBTH has picked four mansions in the very center of Moscow that are open to visitors. If you have already seen the Kremlin and Red Square and you're looking for a quiet place to escape the crowds, you should probably head to Myasnitskaya Street. Take the subway one station from Okhotny Ryad to Lubyanka and you will find yourself in an old, but recently restored stretch dominated by an eggshell-blue neoclassical palace at Myasnitskaya 7. If you happen to be in Moscow this summer you will have an opportunity to see the exhibition "Alice in Wonderland" displayed in Saltykov Mansion commemorating the 150th anniversary of Lewis Carroll's masterpiece. The halls of the mansion have been transformed into settings from the story. A projection of the Cheshire Cat's smile soars above the neoclassical marble stairs and in the great hall you will see a giant tea cup with a spoon that can be used to stir huge lumps of plastic sugar. 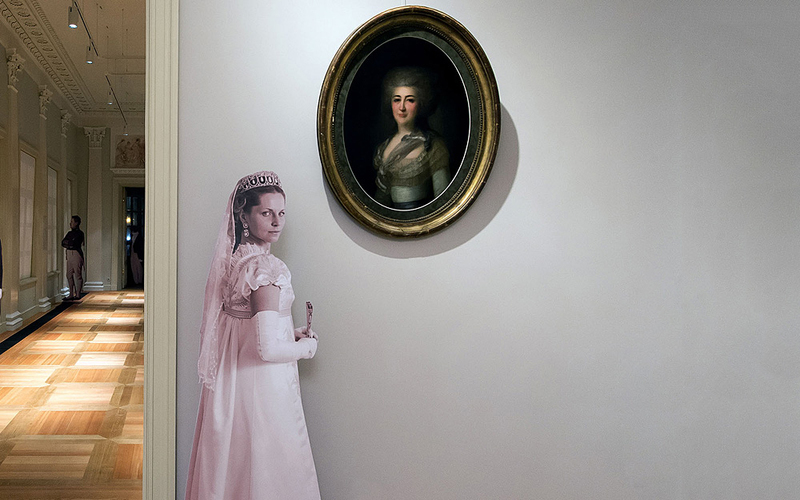 The exhibition has blended into the mansion's ancient interiors so seamlessly that the organizers have decided to keep it up for another season. Looking for a place to take a stroll along Moscow's old alleyways or are you simply lost searching for the Gogol Center Theater between Kurskaya and Baumanskaya metro stations? Head to Staraya Basmannaya Street where they have recently renovated a neoclassical palace, which is a textbook example of a Moscow mansion from the 18th-19th centuries. The palace's showrooms include the hosts' chambers overlooking a quiet courtyard and a classical enfilade that was used for receptions. A nice surprise is the base floor, which was formerly used as a utilities area that is now a coffee shop where you can taste and buy a rare Moscow delicacy – a Kolomna pastila. Until July 26, the mansion is hosting an exhibition by the Brazilian documentary photographer Sebastião Salgado comprised of work from his Genesis series, which was shot in 100 countries around the world over the course of eight years. Moscow's literary mansions, which used to belong to the families of Leo Tolstoy, Anton Chekhov and Alexander Pushkin, generally resemble writers' memorial museums. However, Tolstoy's mansion in Khamovniki is quite outstanding from an architectural perspective as well: it is that rare Moscow building that is both made of wood and more than two centuries old. Tolstoy bought the mansion in 1882 and spent every fall and winter here with his family for more than 20 years. The mansion park, its interiors and the household items of this large noble family (Tolstoy had 13 children) have been perfectly restored. The mansion is located about a three-minute walk from the Frunzenskaya metro station or about 20 minutes on foot from Gorky Park across the Andreevsky Bridge. Located in an old industrial area a short walk from the Elektrozavodskaya metro station, this two-story art nouveau house is quite a site in today’s Moscow. This district of the city is far from glamorous, but the mansion forms quite a spectacular ensemble along with the neighboring Soviet "Palace-on-Yauza" and the pre-revolutionary neo-Gothic Elektrozavod (Electric Factory). The mansion is remarkably well preserved both inside and outside and features a massive, original wooden staircase and an art nouveau-inspired fireplace, with matching study furniture and wall lamps. Today the building houses a branch of the Russian State Library, which often holds free musical events.